Don't let Mother Nature win the chess match. The North Face's Condor Triclimate® Jacket gives you a serious "checkmate." This three-in-one jacket adjusts to unexpected weather changes with a removable WindWall® soft shell liner and underarm vents. The waterproof-breathable outer shell is always ready for cold, wind and moisture. 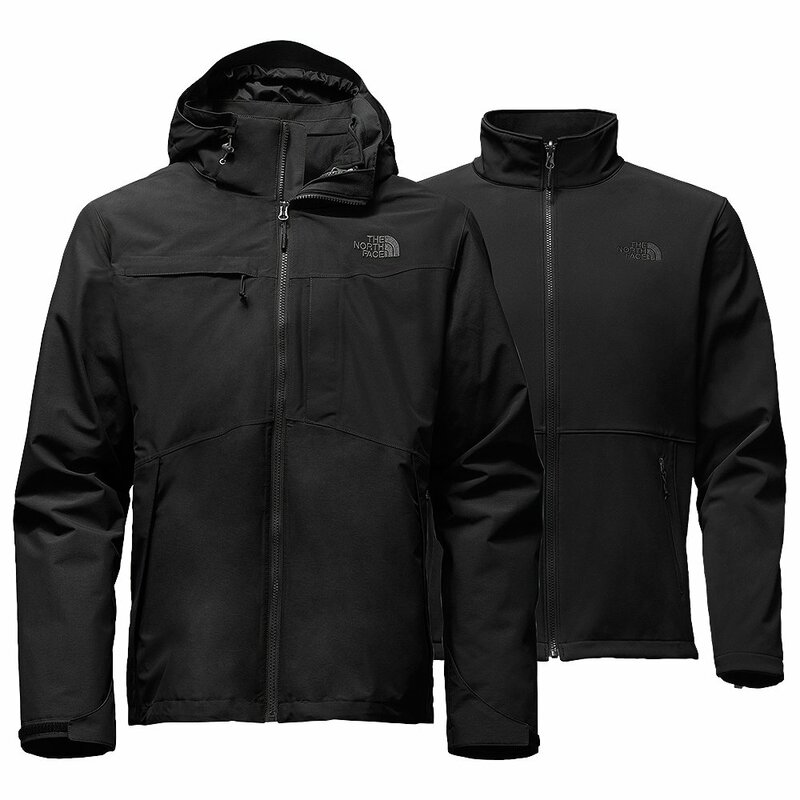 The Triclimate® zip-in design is also compatible with other TNF garments. Features on the outer shell include a removable hood, two concealed zip chest pockets and Velcro® cuffs. "can I use for the temperature around -20~-30 degree?" "This jacket is rated for temperatures 15°F and below. However, for those temperatures we recommend using a baselayer and mid-layer. Hope this information helps!" "the prior response said the jacket is designed for 15 and below. But is it going to be too hot in 20-30 degree weather?" "This jacket has a 3-layer system if you want to unzip one of the layers and has pit-zips to help regulate your body temperature if it gets warmer. " "My chest size is 39.5. The chart says Medium but should the layers play a factor?" "Based on the information you provided, we would recommend you stay with the size medium. " "Does this jacket have interior pockets?" "Yes, this jacket has interior pockets"
"Do they run big in the sizes." "The North Face Condor Triclimate Ski Jacket is a relaxed fit and runs true to size." I have had this coat for about a month, but until last night I never really had an opportunity to check out whether it could keep me warm or not in cold weather. Although, it is still November here (mid-Atlantic area), the temperature last night dropped into the upper 20s F. I went outside to do an errand just before midnight with the coat, and I would have to say that I was somewhat disappointed in the coat's warmth. It was about 35 F and very breezy, and it seemed to me that I could feel the wind penetrate the coat a little bit. I think that if it had been lower than about 25 F and windy, I would have been cold without additional clothing layers underneath the coat (I had a lightweight flannel shirt underneath the coat). So, my early evaluation (without actually being in cold temperatures) is that you will need additional clothing layers under this coat if you will be on a ski slope when the temperature is below about 25 F and windy. Thus, my opinion at this time is that this is a coat for moderate winter climates rather than the colder northern climates. Bought this for my husband (I bought the women's) last year. It's a nice coat, not very warm tho. The Apex jacket inside wasn't even close to being able to stand up to WI winters. You may as well be wearing a sweatshirt and a windbreaker outside. But, if you swap out the Apex for the Denali... voila! Nice and cozy! I have the down Denali and my husband has the regular Denali. The Apex is a nice fall outer layer, so its not all bad. I love all three coats as does my husband. Not really waterproof as advertised... jacket will get soaked on the outside but dry inside. I was expecting raindrops to bead off but it absorbs it instead. Poor craftsmanship. Hand cuff velcro already peeling off. Poor abrasion resistance. Jacket is scratched up from a fall down a slope. Zipper movement is rigid. Zipper puckers 3/4 up. Tight hood. Not really helmet compatible. This is stylish multilayer jacket. Not too bulky, nice detailing with plenty of pockets and removeable hood. The removeable liner is a nice light jacket on its own! Would definitely buy again. Size M for a 6ft, 140 lb 17-yr old. Like the color for my husband. Excellent! Great product, very well made and so functional! Absolutely love this jacket. The tri-climate makes for a very versatile product for all seasons! Love that this jacket has multiple layers but it lightweight. Great for any weather. Love this jacket. It's not too big/fluffy but provides amazing warmth. It has been negative degree weather for over a week now and I have felt very warm in this wind proof, waterproof, and well insulated coat. I've never had a coat like this before and if it lasts me the rest of my life I won't need another. Best jacket in the world ! from Patchogue , Newyork ! I got it as a Christmas gift and I absolutely love it ! It futs perfect its warm and i can wear it wherever i go no matter the ocasione ! Best jacket ever!! He's glad he got it before christmas!! Best jacket! I gave it to my significant other before Christmas because he is in and outside a lot throughout the day and it's been cold here in the N East! He says he's warm everytime he goes out side to supervise! Love it!! Not warm enough for alternatives in the same price range. Great! Just in time for winter! Firstly, I bought this coat this fall to get me through the winter time as well. This is not constructed to be a cold weather coat in my opinion. This coat could be used as the inner liner only or put together. If you're going to use the shell, it could be used as a windbreaker. It was surprising how thin the shell was. I was disappointed with both the liners and shell pockets. No insulation and not enough of them. I gave it 3 stars for the liner which I did like for 50 degree weather. I definitely would recommend these jackets to anyone who needs to keep dry and warm! Basically just bought it for recreational use and it's my favorite jacket! Keep and eye on sizes though.. Would recommend a size lower than the size chart says! Great! Exactly what I expected. I got this for my boyfriend and he loves it. It feels really light weight. Purchased for my teenage son and he really likes it. He has worn this jacket all three ways. This jacket is very bulky. If you're looking for something to wear around town I would not recommend this jacket. The collar flails out like a 70s butterfly collar, personally this looks silly to me. If you're 12,000 feet in the mountains it would be great, otherwise go with something around 31 to 34 oz. The Arrowood is a nice alternative.